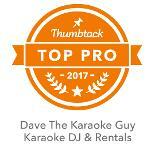 for Dave's karaoke DJ and rental services! The professionalism and personality you display made you my top choice. ─ Ana, Ellicott City, Md. What a great company! Dave came on time, set everything up for us, showed me how to use the equipment and was gone in about 30 minutes. He was very respectful of my home and explained everything he was going to do before doing it. I was very impressed with this company. We would definitely recommend him and use him again! ─ Rachel, Bethesda, Md. Very professional and great at what he does. We will definitely be having him back for our future events. ─ Memphis, Washington, D.C.
David did a great job. He was prompt and very accommodating to all our party guests. I would highly recommend him, and we will be using him again in the future. ─ Mike, Leesburg, Va. I can’t tell you how much fun we all had. Everyone is talking about it being our greatest party ever. ─ Jennifer, Washington, D.C.
My experience was great, we used this machine at my church's annual harvest festival and it was a huge hit among old and young. Would highly recommend. Very professional. ─ Pandora, Washington, D.C.
Dave was great to work with - he provided extra songs that I requested, completed the full set up of the equipment, and gave me thorough instructions on how to use it. He communicated well throughout the rental process. He will be my first call next time I have a karaoke-themed celebration. ─ Andrew, Alexandria, Va.
Dave was outstanding! I will definitely use Dave in the future and highly recommend him! Great service, prompt, courteous, and knowledgeable....and he can sing! Would definitely use Dave's services again. Awesome guy. ─ Samantha, Gaithersburg, Md. We recently used David for my daughter's 8th birthday party. He set up everything, clearly explained how to use the equipment, and came back later to pick it up. The kids had a blast and I barely had to do anything. I highly recommend him. ─ Julie, Arlington, Va.
We had an all-around great experience with Dave the Karaoke Guy. He was responsive from the very beginning and helpful in picking out a package. His equipment and song selection were great - no problems at all. Nice guy, too! ─ Kristina, Alexandria, Va.
Dave The Karaoke Guy was awesome. He delivered the equipment on time & as promised, and picked it up when he said he would. His library of karaoke tunes was extensive & diverse. We will definitely use him in the future. Thanks to Dave, we had a great karaoke experience. ─ Jerry, Columbia, Md. 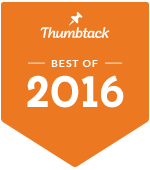 Words are hardly enough to express my appreciation and thanks to you for helping to make this year's event such a success. The karaoke was a great hit -- especially with staff. I've had lots of feedback saying we need to do that again! ─ Karen, Fairfax, Va.
Great selection of music, punctual, friendly…2 thumbs up! ─ Bonnie, Upper Marlboro, Md. Thank you, thank you, and thank you! You saved the night for us all. Everyone enjoyed it and we are looking at when to have the next one!! ─ Sharon, Germantown, Md. Many thanks to Dave for helping us ring, I mean sing, in the new year. Those who joined in thoroughly enjoyed themselves and others really enjoyed the entertainment. Dave was timely, professional and has a pretty good song library. We look forward to another opportunity. ─ Jade, Odenton, Md. After posting a need on Thumbtack, I spoke to Dave less than 24 hours before our office holiday party for karaoke services and he was available and his prices were reasonable. He quickly sent me the contract and I called and finalized details and paid the deposit. The whole process was seamless and he was easy to work with. Our team loved having the karaoke - it was a great addition to the party. 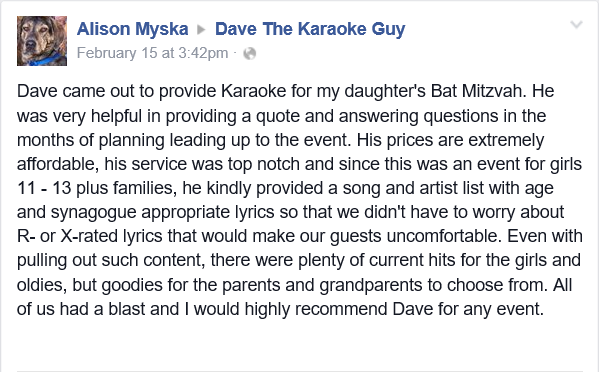 I highly recommend Dave for your karaoke party. ─ Tiffany, Rockville, Md. Thanks so much for a great time at our company event on Friday. Everyone enjoyed the music as well as the karaoke, and I am hearing positive feedback. ─ Kristine, Gaithersburg, Md. We highly recommend Dave The Karaoke Guy. We enjoyed the whole system - it was easy to use and with lots of great song choices and fun for all ages. ─ Maria, Washington, D.C. Working with Dave was great. He was punctual and brought all the equipment needed as well as equipment that might have been needed, which we ended up using in the end. He had songs from every genre, old and new. We had a great time and will definitely use his services again. ─ Nada, Fairfax, Va.
David was easy to work with, accommodating of our guest's karaoke requests, had just the right amount of equipment, was fairly and reasonably priced, and kept the performers coming in and the stream of music flowing. In short, if you are looking for karaoke, I highly recommend him. ─ Adam, Baltimore, Md. Not only is David a professional, but he's also a really nice guy. He was very accommodating and created a Springsteen track my husband asked for. He is punctual, played just the kind of music our group was looking for and we would recommend him to anyone. Thanks again, David! ─ Sally, Woodbridge, Va.
David is a great host. He has a fine system and creates an exciting and memorable event. He did a gig at my house on a Sunday afternoon which went way past midnight. No one wanted to leave even with work the next day. ─ Peter, Silver Spring, Md.